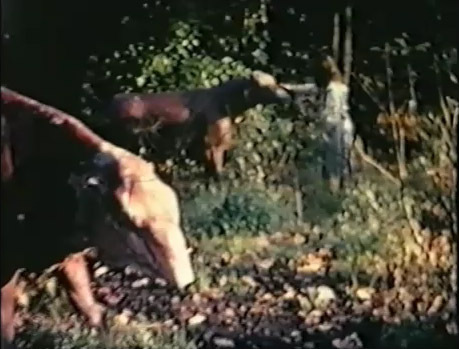 The rare and much discussed Barney Bubbles ‘Alice In Wonderland’ film (made with Michel Parry and a bunch of our other friends) has been unearthed from the vaults and can be viewed here! Barney Bubbles (Colin Fulcher), who was my old pal back from those times can be seen on the film, as can Rosemary Chester who plays Alice. 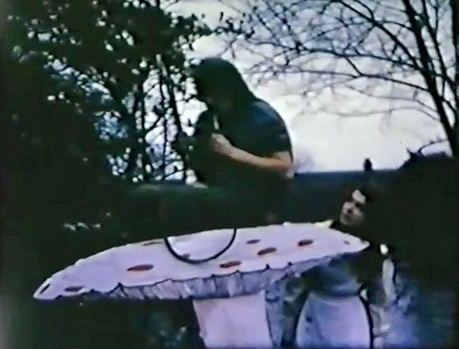 Barney Bubbles film still: The Caterpillar sitting on a mushroom smoking a hookah. 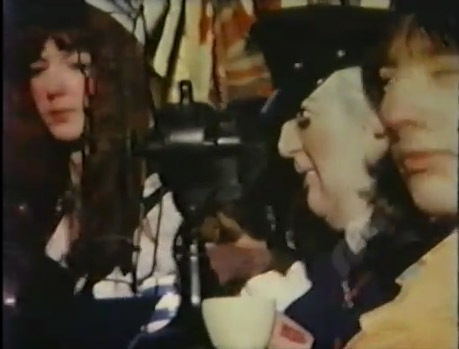 Barney Bubbles film still: Mad Hatter's Tea Party, Barney is on the right, looking towards the camera. David ..I reckon this film must have been a long on-going project of Barney’s…Jennie and i hitched to Matala Greece and Istanbul, via Paris ( i guess 67) and ended up making ( I guess a Super-8 ?) version of Alice In Wonderland with Jwennie paying an Alice type figure..in the gardeen of a house in Boulogne Billancourt /Paris..where Barney was staying….and here we are stil together x from Stroud .Werer you there too? Yup, sure is, it’s the fromer labour PM, Mr Wilson, the taxman of Beatles fame. At one pont in the tea party there a guy wearing a pointed hat that came from a street find on the North End Road, including someone’s complete Jordanian I.D. The top hats were from the old Peterborough Road days of Chris Higson and Mick Jackson when the hats were often worn to Trad-Jaz events. Reading Ciao Manhattan it’s easy to imagine what awaited. But Helen’s sage advice not to get hooked-up with the Factory crowd too much kicked in and I slouched off, early as usual, leaving the party, back to the pin factory on Grand Street. Thereby avoiding a disolute life of depravity, speed and an early death. Yes, the Warhol crowd were represented in 1967 at Leigh Court by Helen, who loved our set-up and compared it favorably with Andy’s doings, but without the death thing. She gave smart advice that has followed me through life, “An artist is one who does art, that which is done by an artist is art.” She also said that Brice had said that once you had worked in ad agency you could no longer be an artist. I expect he said that thinking of Andy W who had toiled in the art department at JWT or similar, I figured it didn’t apply to me ‘cos I’d only worked at DPB&T long enough to act as a catalyst on the boss and send him to New York..
… er, isn’t that comment from Bear Driver, about Bear Driver? David, whilst we’re loosely on the theme of creative projects based on literary works, do you have any recollections of the Hobbit you and Barney Bubbles made, around 1968? Hi there good people one and both, no I can’t say as how I do, having little, nay no, memory of the occasion. Are you sure I was there?